As we will see in a moment, Reid and Moy know less about the market, black, white and grey, for Assisted-GPS (A-GPS) than anyone could after about 15 minutes. Motherboard then went straight to one of the new seat-warmers at the Federal Communications Commission (FCC) for a vague mumbles involving the word investigation and included a quote from Senator Ron Wyden (D-OR), a ranking member of the Senate Select Committee on Intelligence who gave up investigating the Snowden revelations quicker than Neville Chamberlain could sell pieces of Czechoslovakia on a Munich street corner. The gist of this story, which was amplified by both the Verge and Boing-Boing, is that a now-defunct third party data broker, CarCerOne, was buying real-time data from a second hand data broker, LocationSmart, and selling that data to bounty hunters. Time was not spent on examining the whole market. “A Second-Hand Data Broker” as a descriptive introduces a whole ecosystem of data transactions, companies, investors, laws, administrative rules and government agencies while normalizing this huge system of privacy invasion in a single sentence. The market is called Location as a Services (LaaS). LocationSmart, who was selling to a fly by night firm that oversold the data to bounty hunters, is a fifteen year old company founded for the purpose of doing this kind of business. Their start up capital came in part from HIG Capital, the same firm that passed through a controlling stock purchase in voting machine manufacturer HartInterCivic to the Romney family investment fund Solamere while bundling campaign donations for Mitt Rom If their hearts are where their grey money is, these are Center-Right Establishment Republicans having ownership interest in the mechanism of your vote and your exact location in real-time. Were I an editor at Motherboard I might instruct my reporter to get a quote from a Centrist Democrat on that little angle, but I don't work for a billion dollar company founded by self-described Western Chauvinist Gavin McInness. What Motherboard also failed to notice was that LocationSmart was called out on this by TechCrunch in May. Again Ron Wyden was mentioned for comment and this time not even directly quoted. LocationSmart was selling real-time location data to Securus. Securus is a market leader in phone services to prison and they use the government subsidized hostage situation to extort huge fees from prisoner's families and communities. 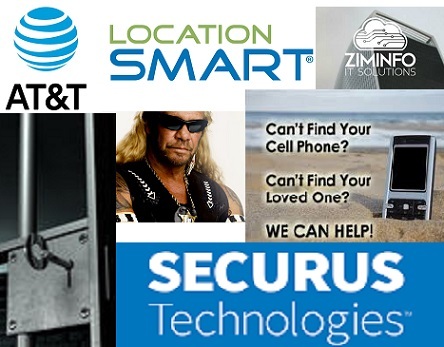 Securus then sold real-time location data to state and local law enforcement. The effect of this is that it entirely bypasses the need for a warrant. Any given policeman can needs expenditure authority from their department and a laptop. It should not then be shocking that bounty hunters, in other words privatized slave patrols, would be the next little piggies found down the trough. The whole concept of LaaS, which is marketed to the public through phone-recovery services like Locateurcell and various teen and elderly parent location app services that proliferate like teddy bears full of nanny-cams, creates a business record of every transaction, every look up. That business record in turn is open to the federal government without a warrant under the Business Records section of the Bush instituted and Obama approved USAPATRIOT act. No agency needs to give your actual cellphone provider a National Security Letter specific to you. They do not have to go to the Foreign Intelligence Surveillance Act (FISA) court for a rubber stamp. They can just look it up in the data they have already acquired in bulk as part of their daily function. The injection of bounty-hunters who are private cops for private prison-banks into the mix is not shocking if context is provided. This, along with Securus, and even second-hand data brokers like Location Smart, are simply part of the privatization of the police state. It channels public dollars for privacy violations and abuse into private hands while vaulting over the thinnest of safeguards. Why no news outlet has looked at the whole ecosystem of LaaS as the center of the problem is a testament to self-censorship through the ideological hegemony of the police state over the very context of human rights reporting.